A volunteer in the First World War, Walter (Bill) Leadley later changed his views, calling on the New Zealand Returned Servicemen's Association (RSA) to ask its members to work steadfastly for the goal of a world federation of nations and world disarmament. Citing resolutions passed by the dominion conference of the NZRSA and the conference of the British Empire Service League, which urged the New Zealand and Empire Governments to provide such defence forces as would mean they were well prepared for any future war, he submitted that by passing such resolutions the RSA was in fact encouraging the arms race. He disagreed with the old slogan '[t]he best way to secure Peace is to prepare for War' and deplored the amount that was being spent on armaments internationally. Britain was no longer demonstrating a belief that disarmament was the surest way to secure international peace. The alternative that Bill Leadley put forward was for nations to realise 'their dependence on each other and the necessity for international economic agreements' and for the creation of a world federation of nations. He asked that the NZ RSA 'whose members realise the horrors and folly of war', should work steadfastly towards this goal. Such a conference would have had a great moral effect, and would be an event of outstanding importance in helping forward the splendid work of the League of Nations, which some day may itself develop into a “Federation of World Nations”, and create a “Parliament of Wise Men” [sic] from all nations to ensure the welfare and happiness of humanity the world over. 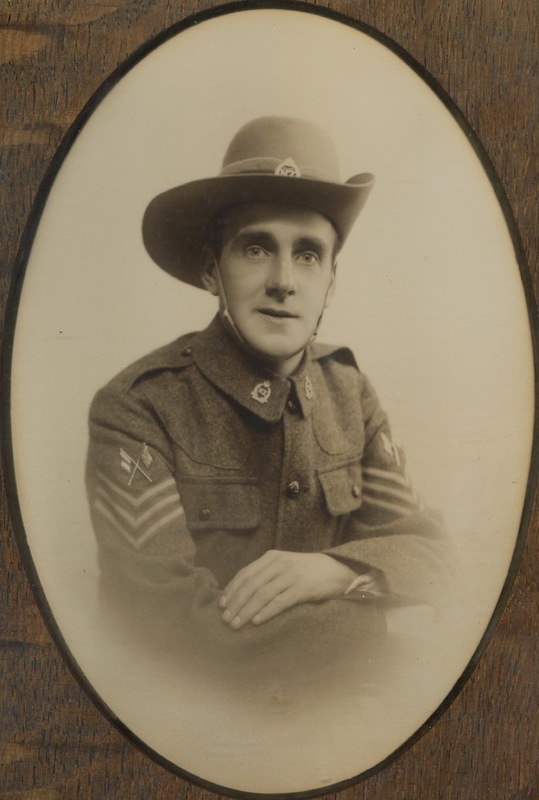 Walter Edmund Leadley, always known as Bill, was the son of a Primitive Methodist minister in Yorkshire, England, who came out to New Zealand in his 20s and on the outbreak of war, was eager to enlist. There is a family story that the warrant officer told him he did not fit the bill because of his small stature, but changed his tune when Bill Leadley told him he was a qualified telegraphist, skilled in Morse code, heliograph and semaphore. He quickly became a sergeant in the 1st Battalion of the 2nd Corps of the Canterbury Regiment, and served as a signaller at Gallipoli and the Somme, suffering severe wounds in both battles. His experience at Gallipoli was so profound that while there he made a vow that if he survived, he would do all he could for his fellow service-men for the rest of his life. While he was in hospital after the Gallipoli campaign, he wrote a diary covering the months from April to December 1915 and many years later this was published as Shrapnel and Semaphore: My Grandfather's Diary of Gallipoli. Back in New Zealand he was appointed Secretary of the Christchurch RSA in November 1918 when the membership numbered 890. By February 1920 it had grown to 5,100. When he became secretary, repatriation boards had not yet been established, and the RSA acted rather like an employment agency, with Bill Leadley placing 93 men in employment. Once the boards were established he joined the Canterbury board as a Government nominee and was a strong advocate for the employment and repatriation of returned service men. Bill Leadley's views were clearly conservative when, in 1921, he attended the Empire conference of ex-Service men in Cape Town and reported back to the RSA in Christchurch that he supported a 'white New Zealand ' policy. He also said that while he did not advocate the keeping of large armies, 'we must see to it that the Empire was adequately defended and all the Dominions must help in assuring that defence. It would never do for the Empire to be caught unprepared as she had been when Germany made her effort’. In 1928 he resigned from the secretary-ship of the RSA, remaining on the executive of the Christchurch RSA and as Dominion vice-president. He stood as a Reform Party candidate in the Avon electorate, though he must have known that he had little chance of success against the sitting Labour Member of Parliament, Dan Sullivan, who was also a Christchurch City Councillor. By this time Leadley too had been elected a member of the Christchurch City Council and the North Canterbury Hospital Board. His bid to become an MP was unsuccessful and he was largely unemployed for the next two years. But in 1931 the Disabled Servicemen's Re-establishment League was set up and he was appointed as District Officer for Canterbury. He went on to become General Secretary of the Disabled Servicemen’s Re-establishment League and wrote three books describing the work of the league. By 1934 Bill Leadley had undergone a change of perspective, which is evident in the article he wrote challenging the RSA to think about the question of peace and war and to consider what its policy might be on this question. Given his long and ongoing association with the RSA and his life-long commitment to working for the betterment of his fellow returned service-men, it was a courageous stand to take. The question of whether Bill Leadley's article should be published was discussed at a meeting of the Dominion Executive committee of the NZ RSA in 1935, and the decision was made not to publish. Bill Leadley was awarded the OBE in 1946 and retired in 1956 after 38 years of serving his fellow ex-service-men. W.E. Leadley, 'Peace or War: Where does the R.S.A. Stand?' 5pp typescript, p.5, Kate Dewes, personal collection. Leadley, 'Peace or War’, p.1. Leadley, 'Peace or War’, pp.2-3. Leadley, 'Peace or War’, pp.3-4. Leadley, 'Peace or War’, p.5. Handwritten note by Leadley's son Ian, Kate Dewes, personal collection. W.E. Leadley, Shrapnel and Semaphore: My Grandfather's Diary of Gallipoli, ed. Jan Chamberlin (Auckland: Radio Pacific, 2001). 'Christchurch R.S.A. ', Quick March, 10 February 1920, pp.53-54; 'Employment for Soldiers', Evening Star, 29 March 1919, p.6; 'How to Celebrate Peace', Star, 27 June 1919, p.3. 'Serving the Empire', Press, 4 May 1921, p.7. Leadley, Shrapnel and Semaphore, pp.54-57. General Secretary NZ R.S.A., to W.E. Leadley, 1 March 1935. Kate Dewes, personal collection.